Holy greens this week! 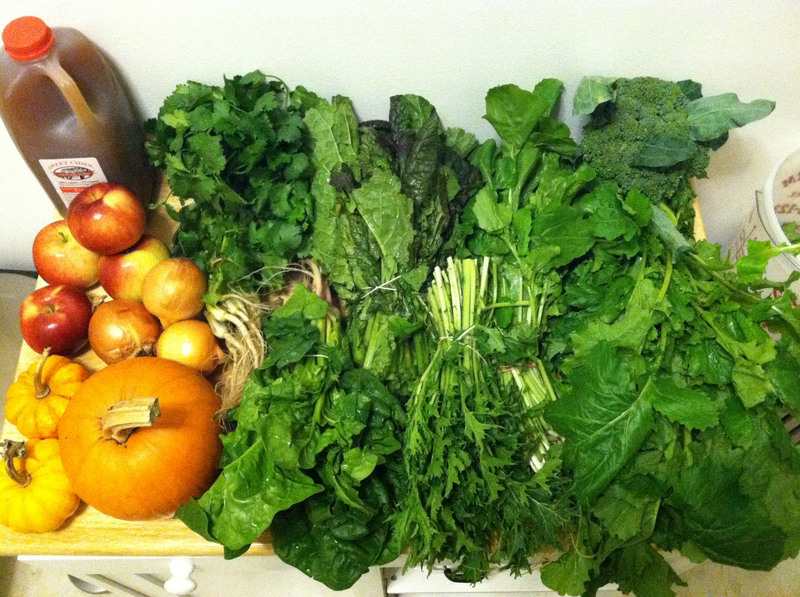 This is what my partner, Brian, and I got in our MimoMex Veggie and Orchard half shares: mustard greens, red mustard greens, arugula, mizuna, spinach, broccoli, cilantro, onions, baby pumpkins, a Sugar Baby pumpkin, Empire apples, apple cider. Usually I try to clear out the fridge before my pickup so that there’s room for CSA goods and we don’t have any leftovers to eat (which would discourage us from cooking). That didn’t happen this weekend…we had guests over and ordered a ton of takeout one night instead of cooking, so not only did we have all those leftovers, we had a bunch of veggies that I’d been planning to cook. No room in the fridge! 1. Drank the last of some white wine to get rid of the bottle. Need to start somewhere! 2. Finished up some takeout for dinner. No cooking tonight; clearing/storing only. 3. Cut our losses and traded some wilting cilantro for this week’s lively cilantro. Put the new cilantro in a glass with water (like a bouquet of flowers) and with a small plastic bag over the top. Old cilantro went in a bin for composting. 4. 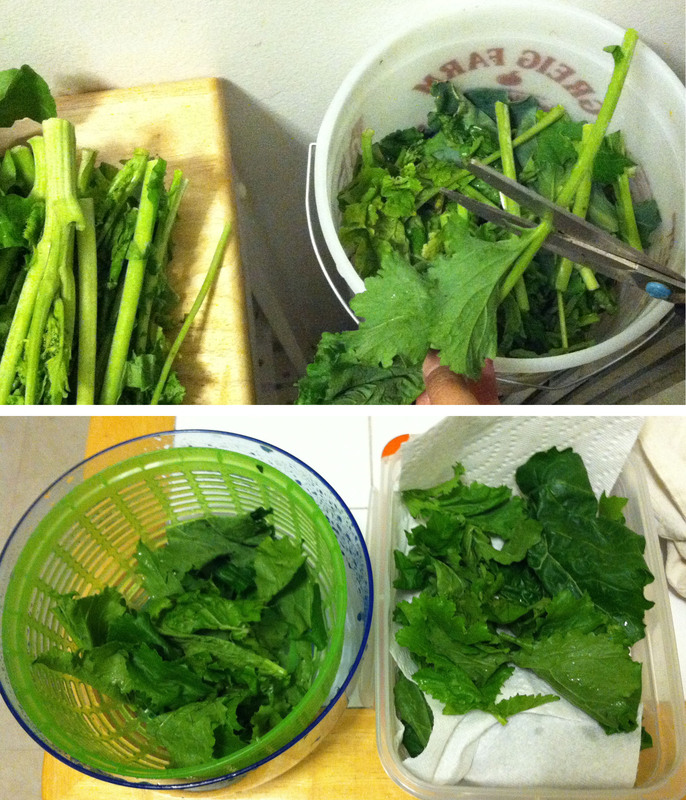 To help the rest of the greens last longer and reduce their bulk: picked out the wilted ones, trimmed off the stems, washed and spun the leaves, and packed them in plastic containers lined and layered with paper towels. Way laborious but worth it. 5. Consolidated carrots and celery with some radishes from a previous share in a FoodSaver container since they’re all supposed to be stored the same way anyway (with moisture and the air vents closed) and none of them produce ethylene.